Hot Coupon Still Available! 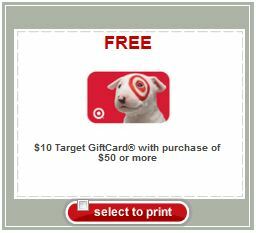 FREE $10 Target Gift Card with Purchase of $50 or More in Store thru 12/8! If you missed it yesterday- I just want to let everyone know this hot coupon valid for a FREE $10 Gift Card with a purchase of $50 or More is still available! This offer is for in-store purchases only and this coupon is only valid thru Saturday, December 8th. There is a limited number of coupons available so print it while it lasts! You can combine this coupon with other coupons for even bigger savings! And while the fine print states that GiftCards will not count toward the total- in my opinion this refers to Target GiftCards and you can try purchasing other Gift Cards like restaurant, itunes, Disney and you can use the coupon to get a $10 Target GiftCard back. My hubby picked up a $50 Disney Gift Card this morning and used the coupon with no trouble, and no beeps, but just letting you know it may be a ymmv. You can also use other coupons with this coupon – just be sure your total reaches $50 before tax and then hand over this $10 Gift Cardcoupon FIRST. Then hand over the rest of your coupons. It also does not seem to be a problem when using it on a transaction that earns a Gift Card as well. Thank you for all of your work… I have a question about this gift card coupon, can we use it along with the $5.00 off coupons that we received in the mail on the booklets? I know we would not get to work the deal like the one here, but it could help with the toys, electronic and home coupons. Thanks! Hey CIndy- I think you may be able to since one is awarding a Gift Card and one is $ Off purchase. you will just have to try and see- but your total will need to meet the minimum purchase requirement after either coupon. SO for example if you have a $5 Off $50 and then a $10 GC coupon- you will want your total to be $55 at least before tax- then hand $5 off $50, now you still have at least $50 before tax to hand hand your gift card coupon over. hope that helps and makes sense! Read the $10 gift card exclusions…tax & gift cards received are not included in the calculations. SO for every GC received in the transaction add it to the $50 that you must spend! Hey Janet- that means Target GiftCards purchased in your transaction, not Target GiftCards earned. My scenario does not count them toward your total- they are a wash. So for example- you buy 2 Starbucks at $7.99 and get a $5 Gift Card back- you only count $15.98 (2 starbucks at 7.99) toward your total, you would not count $20.98 toward your total. I went today and used it. Spent about 60 bucks towards my groceries ( going again tomorrow) got my 10.00 gift card.. Plus tomorrow I am going to use my 8.00 of 80.00 purchase that i got the other day..
I’m used the free $10 gift card coupon with my pampers purchase! Get 2 Giant Pampers boxes at $34.99 each and when you buy 1 you get a $5 gift card. So since I got 2 I got $10 plus the free one! And of course I used my P&G coupons and the Target mobile coupons! Kerry, if there a limit to earn gift cards depending of the item, (like Cvs does with Extra Bucks), or can I get 6 Mio water enhancer and I’ll get 2 $5 gift cards, or there is a limit of 1 card for that transaction and if I get 6 Mio I’ll only get 1 card? Just wanted say thanks for the heads up on this coupon. I printed one yesterday & was able to print another today. Total today before coupons came to $81.22. I used an $8 of $80 coupon that printed at register yesterday, then used the $10 gift card I got yesterday, less 5% Redcard discount, made my total $60.90 plus I received another $10 gift card today. Part of my purchase today was a gift card (not Target). Also, wanted to remind everyone Price Match online. I have done this twice at Target & got some really good deals. I too used mine on diapers but on huggies. Bought 2 Giant packs of Huggies for 34.99. Got 2 $5.00 Giftcards Used 2 $3 off huggies from the walmart website, Used 2 $3 off target huggies coupons from the 12-2 celebrate the savings plus got a $10 GC for spending over $50. So I got each box for 18.99. For size 4 that was .14 a diaper which is good for that size. Amazon mom sells their huggies for size 4 for .28 a diaper. I will take that! I was able to print the coupon and got some great deals. However the target I went to wouldn’t accept the manufacture coupons on the Mio! So frustrated,the cashier insisted that it was cause of the $5 gc you receive when you buy 3 mio. I tried to explain to her that was incorrect and asked for the manager, he said we can refuse any coupons we want and I am not going to accept the manufacture coupons on the Mio cause you are receiving a $5 gc, however the $5 gc on the Starbucks deal with the $3 off worked just fine. I was so frustrated and tried to calmly explain that according to Target policy they should accept it. No go. I was really bummed about it, still kinda irked. Thank you so much for the info and coupons. Used two $5 gift cards and one $10 coupon so far this week along with Target coupons. I was also able to print another $10 coupon. Back to Target tomorrow! At what zip code is the $3 off 2 Right Guard products? Can’t find… Is it gone? I used this coupon on prescriptions at the pharmacy and it worked. I’ll do another one on groceries on Sat. I printed this then went back and printed again (I usually can print 2 Target coupons each) but noticed that they have the same numbers on them. Is that normal? I want to be sure I’m not using 2 and one isn’t any good. Thanks! Hi Kerry 🙂 I had a question about your end calculation for the Deal Idea you listed. Shouldn’t we get an additional $10 GC for the $50/$10gc coupon? Tried to use this today but was told I had to have $50 in merchandise AFTER other coupons were deducted, and not before. For example, I had $51 in merchandise and $4.50 in coupons and was told I was only buying $46.50 in merchandise so I could not use the $10 gc coupon. Ended up keeping my $4.50 coupons and just using the $10 gc coupon. Were you told the same thing? I have used this coupon twice. First I did the Starbucks deal, Rightguard deal and the Centrum deal twice and earned a total of $25 in giftcards. Then yesterday I tried it on Xbox points and a $25 prepaid gaming card-teenage boys-and along with candy got another $10. After my 2 Ghiradhelli coupons and using my Target red card my total came to $48 something! went to two different targets yesterday and the Right Guard was all gone 🙁 bummed. maybe I can try again today. Does anyone know if an xbox live membership would be considered a gift card? Thanks in advance! Cyndi, I purchased and xbox live membership yesterday and used the coupon just fine. I also had them price match it with Amazon & Target online because it is less there (48.99). Just ask the cashier or go to a manager. I purchased roughly 126.00 in 2 transactions. Between coupons, gift card deals, and the Hasbro and Starbucks rebate I will end up paying less than 30.00. Right Guard Body wash and deoderant. I was pretty psyched and will be making lots of coffee/breakfast gift baskets for this holiday! I’ve done this deal three times. It is absolutely untrue that you have to deduct your coupons from the total. That’s why you hand over the Target gift card coupon before handing over any other coupons. Then, hand over any other target coupons you may have before you give the cashier manufacturer coupons. Any employee who tells you otherwise is flat out wrong.